This is your K-drama if you love stories about mental health issues and people struggling with them, and if you enjoy a great love story as well. The performances of all the actors are masterful, especially Hyun Bin, the special effects were believable, and the music soundtrack absolutely outstanding and romantic. I loved every minute of this show. The promotional articles on the web, which first announced this show to K-drama fans, labeled Hyde, Jekyll and I (aka Hyde, Jekyll, Me) a romantic comedy. I remember laughing and shaking my head. "A romantic comedy? Out of that classic story of good vs. evil? Who thought that one up?" I should have known that even web sites that focus on streaming K-dramas can be wrong (in fact they often are, especially when it comes to synopsis!). When the show finally arrived it was re-classified a crime melodrama and romance. I think the first announcements that it was supposed to be a romantic com puzzled the audience, because what we started watching was anything BUT a standard romantic comedy! It was more like a psychological thriller. Instead of a toxic potion causing the personality changes in the lead male character in the original story, here it was a mental illness, specifically the rare mental disorder called DID or Disassociate Identity Disorder (previously called Multiple Personality Disorder) characterized by at least two distinct identities or dissociated personality states that alternately control a person's behavior, and which is accompanied by memory impairment when the alternate personality takes over the person, either for brief lengths of time, or long periods of time. The condition is poorly understood even in the medical establishment, and treatments and possible cures appear anecdotal in the medical literature, rather than studied in controlled, double-blind medical trials for authenticity. Results of spontaneous cures, long remissions, or simply applying coping mechanisms for the illness, have all been seen in the medical literature. So I suppose if you are a scriptwriter you can see a lot of leeway for creativity in this poorly understood condition, with several different scenarios that you can come up with for a set of characters in a television drama. The fact that this disorder often results from a life trauma event gives a scriptwriter even more dramatic license, to create the trauma and reel the audience in sympathetically to the created story and characters. In the case of Hyde, Jekyll and I the trauma was to the lead male character's psyche due to a frightening kidnapping in his youth. The impeding excitement for this drama was not just for its interesting story, but because the drama starred popular actor Hyun Bin (Secret Garden) and this was his first television drama after returning from his two year military requirement term (he entered the Marines, so he didn't choose the easy route!). His co-star, beautiful Han Ji Min (Rooftop Prince), had already worked with him previously in the first movie he made after leaving service, 2014's The Fatal Encounter, an historical film where their two characters often butted heads politically but had a seething attraction for one another underneath the surface of their uneasy family ties. They created a lot of fireworks together in the film so I was fully expecting a repeat in this TV drama; although I did see it in this television drama to some degree, especially in the beginning, it was far more subtle because Han Ji Min's character here was a super nice and caring girl -- with more fieriness reserved for when her friends were being hurt rather than herself. She ends up caught in a challenging situation for which she was unprepared: she starts to care for a mentally ill man who just happens to be her new employer. Robin and Seo Jin - who is Jekyll and who is Hyde? The story begins with the beautiful and spirited Ha Na Jang (Han Ji Min) who goes to work for the corporation Wonder Group which owns a mega amusement park with rides and a circus, as well as other corporate entities. She is planning to be the ringleader for the circus part of the park but when she arrives she finds the CEO in charge of the amusement park, Seo Jin Goo (Hyun Bin), in personal chaos, with an intention to close down the circus part of the corporation because it's too expensive to run. Ha Na is not just concerned with her own job, but for those of her co-workers, including her best friend Seo Hee Choi (Lee Se Na), and she confronts Seo Jin and fights to keep the circus from closing down. She doesn't know at first how mentally ill Seo Jin is: she just thinks he is haughty and cold and she doesn't understand that his stress levels are high due to fears of being taken over by his alternate personality which arose out of the mental illness called DID, a multiple personality disorder, stemming from a traumatic event he experienced in childhood in which he was kidnapped and held for ransom. This alternate personality calls himself Robin (I loved the way the actress pronounced this name: "Rowbean". Too cute!). Seo Jin is so fearful on a daily basis that he continuously takes his body's vitals with a machine, cuts off all intimacy with people, and has no friends. He copes by meditating in a beautiful indoor garden in his mansion. 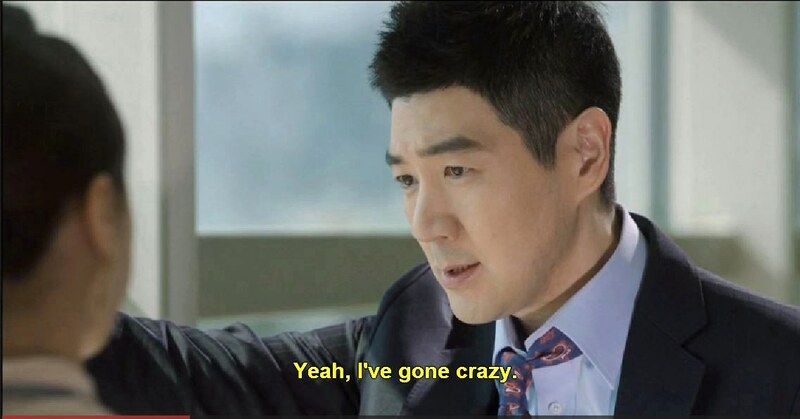 About the only person he can trust is his personal assistant Young Chan Kwon (Seung Joon Lee of Nine: Nine Time Travels) who knows all about his illness and can help fill him in about what Robin is doing when he makes his appearances (most DID personalities have blackouts and have no idea what their alternate personalities are up to). Seo Jin is also terrified of his over-demanding and overly critical father, the Chairman of the Wonder Group, Myung Han Goo (Duk Hwa Lee). He hates the fact that his son is mentally ill, and he has a team of bodyguards at his beck and call everyday in case Robin shows up again in Seo Jin's life. In many ways Seo Jin's secretary is more of a father to him than his biological father. Seo Jin has a female psychiatrist named Dr. Hee Ae Kang (Eun Jung Shin) who calls him and tells him she thinks she might have a cure for his condition, so that his multiple personality Robin will never return. It's been five years since the last time Robin appeared but Seo Jin is still very fearful and immediately wants to see her in her office. When Seo Jin is driven to Dr. Kang's office by his handsome chauffeur Suk Won Sung (Hee Sun Kwak, who made quite a splash with the ladies in the audience!) Ha Na follows him, determined to get him to change his mind about closing the circus and firing all its employees. That sets up a series of wild circumstances that will change their lives forever. Ha Na ropes her way into Dr. Kang's office (literally!) and finds the doctor on the floor unconscious, bleeding from the head. A criminal with a mask on attempts to grab Ha Na and she runs for her life. On her way to the elevator Ha Na runs into Seo Jin who was arriving for his appointment. The masked man is following her, and Seo Jin, terrified only for himself, runs to the elevator and then pushes Ha Na out of his way, putting her in the direct path of Dr. Kang's assaulter. 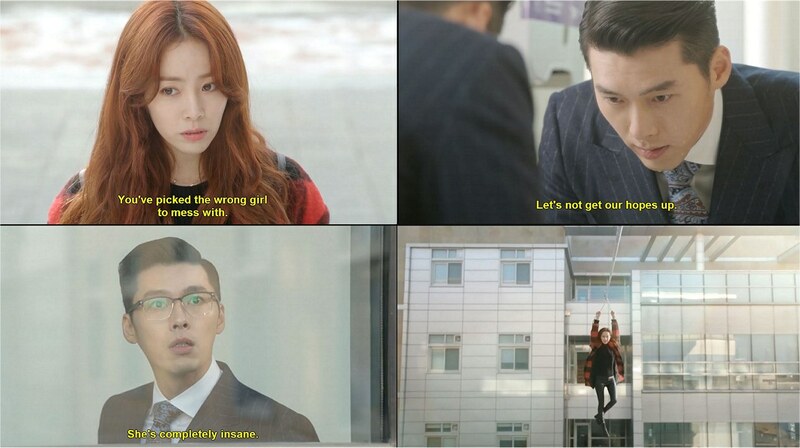 The masked man and Ha Na end up on the rooftop of the building and she fights for her life as he tries to throw her off the top. Suddenly Robin appears! He is the rescuer second personality of Seo Jin and he saves Ha Na from the masked man but they still end up both falling off the top of the building at the same time and land in a lake by the building. Ha Na and Robin descend into the water in an embrace, and so begins the oddest love affair in K-drama history, Ha Na's love affair with Seo Jin's alternate personality! Ha Na wakes up in the hospital and learns that her boss Seo Jin has been admitted too. She visits him and asks him, "Did you rescue me?" and Seo Jin has no memories of any such event, so her words immediately upset him because he knows that Robin has returned. Seo Jin eventually agrees that the circus can remain and little by little, the more encounters he has with Ha Na the more he starts to care about someone other than himself. It's revealed in flashback that Ha Na as a young teen girl had rescued Seo Jin when he was young too, clutching him on a bridge where he was trying to commit suicide, and there is also a connection there with Robin arising for the first time as the rescuer at this moment of their lives, when Ha Na ends up being the one who needs rescuing as she hangs from the bridge. A necklace that Seo Jin / Robin wore back when they were young and to the current day serves as Ha Na's understanding that she had met Seo Jin before at the bridge. The masked man is still in pursuit of Ha Na and in a dramatic scene at the circus, that reminded me of The Phantom Of The Opera, a huge chandelier is cut and dropped by the criminal, and crashes to the ground intending to kill Ha Na but Robin the rescuer appears at that moment to push her out of harm's way. For the first time Ha Na gets to converse with Robin, who tells her he is Seo Jin's twin brother. They end up being very playful with one another, laughing and enjoying the circus trampoline. 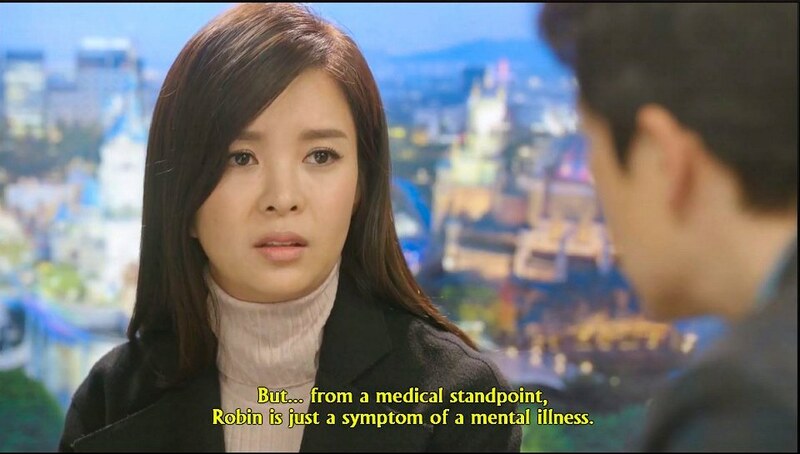 Robin is everything Seo Jin is not: confident, happy, compassionate, childlike, artistic, and funny. I never once blamed Ha Na for falling in love with him! I would have, too ... in the beginning! 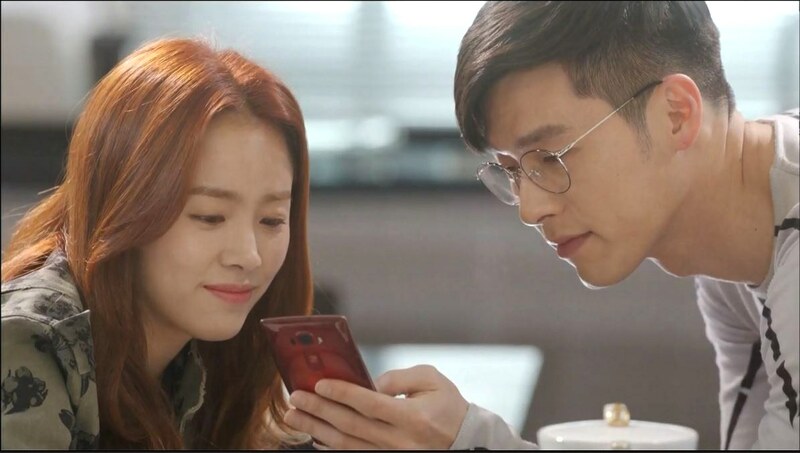 Later, as Seo Jin starts to heal, he becomes much more attractive, with the result that online you saw two camps of fans develop: one group who wanted Ha Na with Seo Jin, and the other group who wanted Robin to stay and be with Ha Na. However, if Robin stays, then Seo Jin would never be healed. What's a caring and compassionate girl to do? Because Ha Na is still being menaced by the masked kidnapper of Dr. Kang, Seo Jin insists that Ha Na move into his secure mansion temporarily as the police work to find Dr. Kang; he is not really concerned about her or Dr. Kang at first, he is insisting on this solely because Dr. Kang had promised him a cure, and if she is never found Seo Jin thinks he will never be cured. Slowly, however, Seo Jin starts to drop his reserves and helps Ha Na out at times. She tries to help him too when he has panic attacks due to the police investigation and even though his first reactions are often rough and curt, eventually they draw closer to one another and Seo Jin begins being kinder to her. In one key scene at a stairway in the police department Seo Jin actually throws himself into Ha Na's arms for comfort. It is suggested to Ha Na that she undergo hypnosis to bring out details of the masked criminal's face, and so she visits a doctor recommended to her named Tae Joo Yoon (Joon Sung, from I Need Romance 3, Discovery of Romance, and Gu Family Book). However, Dr. Tae Joo is not exactly whom he seems to be at face value; he has his own secrets that he is most anxious that Ha Na and Seo Jin not discover. The police arrest someone they think might be the culprit but he has been hypnotized to think he is the criminal, and so Ha Na's life -- and Seo Jin's as well -- continues to be at risk. Dr. Tae Joo opens his office door to see his patient Ha Na -- and meets Robin! The last two episodes in the series are especially poignant, and drew rave reviews from K-drama fans. The love story is so unique and special between Seo Jin and Robin and Ha Na. In one particular emotional scene, taking place at a Korean folk village, actress Han Ji Min knocked it out of the ballpark with her scenes as she finally realizes she may not have much time left before Robin might disappear permanently. She doesn't fancy herself in love with Seo Jin, although she does care about him deeply, but what will she do if he is the only one standing by the end? On drama web sites a disagreement arose between fans about whether or not Robin would just disappear or whether he would merge with Seo Jin. See what you think as the series progresses. Don't miss this incredible Korean drama; Hyun Bin especially deserves the highest acting awards in Korea for his performance here playing two -- possibly three! - separate personalities in one body. Simply with the turn of a head and a glint in the eye you could tell when he transformed from Seo Jin into Robin and back again. Brilliant stuff. 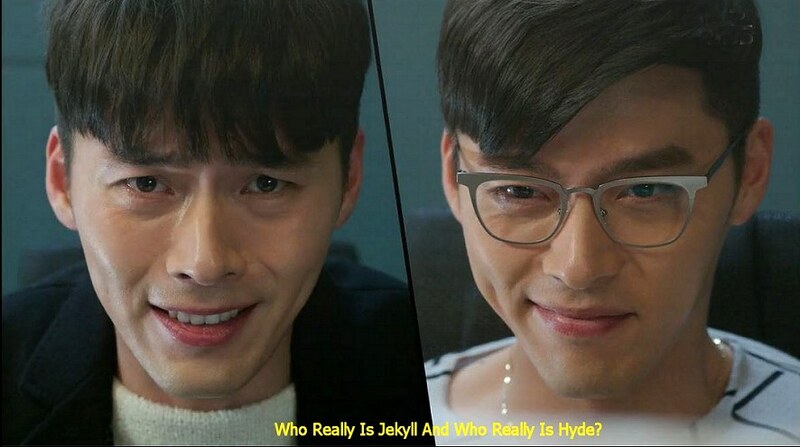 No need for special makeup like in the original versions of Jekyll and Hyde, instead Hyun Bin is capable of making the character changes believable through his facial expressions, the glint in his eyes, and his body language alone! This was a lovely, romantic show with some serious themes, and I wouldn't miss it for the world.